How can you make walking a better overall workout without feeling like you are exerting any more energy? How can you overcome the slouching, neck and shoulder pain many get from working at desks and computers? Across Europe, millions of people have taken up Nordic walking to give them a good workout and loosen their neck and shoulders. 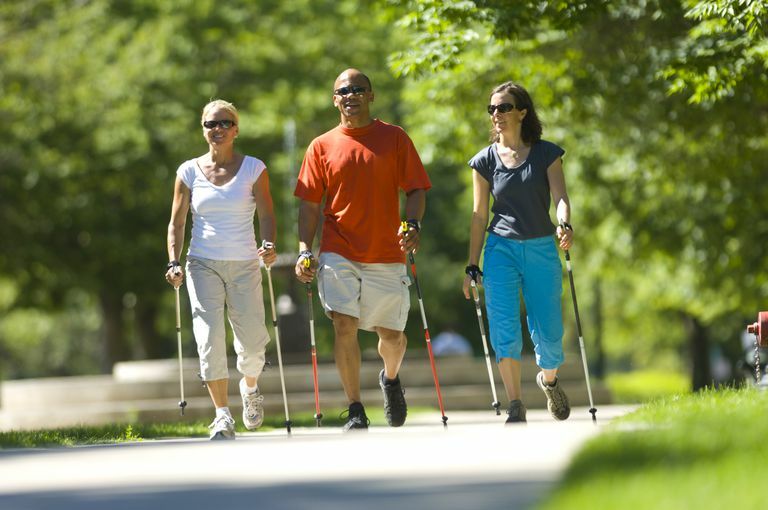 Nordic walking uses two specially designed poles to work the upper body while walking. Like cross country skiing, the poles are used by the arms to match each step the person takes. How is it Better Than Just Walking? For a better but easier cardio workout, nordic walking increases your heart rate without increasing your perceived rate of exertion. You get a better workout without feeling like you are working any harder. While you can get a similar heart rate effect by walking faster, there are many people who do not want to walk faster or cannot walk fast. Nordic walking works the arms, shoulders and upper chest and back muscles through a full range of motion, stretching and lengthening those muscles which are often tight. The motion works to overcome the hunching forward that many people adopt while working at desks, computers, reading or watching TV. Many people exhibit stress by tightening their neck and shoulder muscles. Nordic walking loosens up those knots. On any surface, the poles provide more stability for walkers who have balance knee or leg problems. Proper use of the poles and arm motion encourages good posture. People who had given up walking for pleasure find that they can walk comfortably with the poles. For natural trails, the poles provide stability for walkers much like a hiking stick. The Nordic Walking technique is a simple enhancement of normal arm swing when walking. The poles remain behind the body and pointing diagonally backward at all times. The hands are opened slightly to allow the poles to swing forward - the poles are not gripped but swing from the wrist straps. The leading foot strikes the ground. The opposite arm swings forward to waist height. The opposite pole strikes the ground level with the heel of the opposite foot. The poles remain pointing diagonally backward, they are never in front of the body. The foot rolls through the step to push off with the toe. This lengthens the stride behind the body, getting the most out of each stride. The arm motion is loose and relaxed. Keeping the arms relaxed and keeping the poles behind the body are key elements in the proper technique. Many people use the wrong techniques, planting the poles in front of the body and bending the elbow too much. Athletes and military personnel in Finland have been using walking poles during their summer walking and running workouts for decades. Several varieties of Nordic walking poles are on the market for use in Nordic walking techniques. They have various options. Weight: some poles are heavier, some very light. In general, adjustable poles or spring systems add weight to the poles. Materials: aluminum vs. carbon fiber. Claims are made for the superiority of each for shock absorption, durability, weight. Telescoping, adjustable or fixed length: The length of the pole is critical to being able to use the right technique. A fixed-length pole is usually the lightest weight choice, and on even terrain, there is no need to adjust the pole height. But for those who want to share the poles or want to be able to more easily pack them, telescoping poles are desirable. Check the pole for a good locking system that is easy to adjust yet resists loosening accidentally. Wrist straps and demi-gloves: A comfortable demi-glove is essential to ease of use with Nordic walking poles. The glove should fit well and not cause chafing. These glove systems are constantly improving, check the latest models. For some brands, you can order replacement gloves of the newest design. Glove/Strap Release Systems: Leki Nordic walking poles have an easy to use release system so you can quickly remove your hand and the demi-glove from the poles, and quickly click them back to the poles. This is very helpful for restroom stops, etc. Grips: With Nordic walking technique, the walker does not need to grip the pole at all, it travels via the strap/glove. A true Nordic walking pole does not have a grip that flares at the bottom of the hand, as that hampers releasing the grip at the back of each arm swing. Flared-bottom grips are used in trekking poles where the hiker may bear down on them. Nordic walking grips are usually streamlined and narrow. Tips: Spike tips for nature trails, rubber tips for sidewalk or road walking. The rubber tips should be secure enough to stay put, yet easy to remove when you want to use the spike tip. Springs or other cushioning systems: These elements are more appropriate for trekking poles, but are found on some Nordic walking designs. A lightweight, sturdy pole of the correct length with an ergonomic grip and a very comfortable demi-glove is ideal. Walkers have used a variety of techniques and equipment to add an upper body workout to their walk. Correct arm motion can relieve neck and shoulder tension while toning upper body muscles. Racewalkers use their arms effectively to give an upper body workout. Total Body vs. Half Body: Nordic walking poles add an upper body workout for the deltoids, lats, pecs, triceps, and abdominals. By adding the upper body workout, calorie burning is increased up to 40 percent yet with no increase in how hard the walker feels they are exercising. Nordic walkers get a "total body" workout without feeling like they are working any harder than just walking. Relieve Shoulder and Neck Stress: Using the correct Nordic walking technique with relaxed shoulders, keeping the poles behind the body and using a full range of motion, the walker also releases stress carried in the shoulders and neck. Taking the arms and shoulders through the full range of motion throughout a 30-minute walk is a great antidote to the slouching many people do over desks and computers. Leave the Weights at Home: Exercise experts do not recommend walking with arm weights, which is another popular way to add an upper body workout to a walk. Arm weights put unnatural stress on joints, especially over the length of a recommended fitness walk of a half hour to two hours. Can it Work Without Poles? Walkers can experience similar upper body effects by using correct racewalking arm motion. However, that can be difficult to achieve without coaching. At a workshop by noted coach Martin Rudow, all participants had to be worked with to get the proper arm motion. Loosening the shoulder, concentrating on moving the arms back and not bringing them too far forward or too high were the main objectives. Walkers using the poles can fall into some of the same poor patterns if they plant the poles too far forward rather than at the heel of their leading foot. Walking experts were invited to the Vuokatti Sports Center in Finland. Walking at a steady pace on a treadmill with and without Nordic walking poles, the poles raised heart rate by 10 bpm at the same speed. Some reported that walking felt easier with the poles than without, yet their heart rates were increased. Many fitness walkers do not like the feeling of exerting themselves, yet the best health benefits come from a moderate intensity workout rather than an easy workout. Nordic walking poles raise the heart rate into the moderate intensity zone without the walker feeling like they are working any harder. Nordic walking exertion is in the fat-burning zone. Researchers at Vuokatti showed how much fat vs. carbohydrate burning was done with and without poles. More fat-burning when using the poles was most evident with the editor who used the correct pole technique. Adopting a fast walking technique or racewalking is a great way to pump up your walking workout. But Nordic walking poles are an alternative for those who have difficulty walking faster or do not like to walk faster. By using the Nordic walking poles at your usual walking speed, you increase your workout without going faster. This is also a good alternative for those whose walking partners cannot go faster. Church TS, Earnest CP, Morss GM. "Field testing of physiological responses associated with Nordic Walking." Res Q Exerc Sport. 2002 Sep;73(3):296-300. Willson J, Torry MR, Decker MJ, Kernozek T, Steadman JR. "Effects of walking poles on lower extremity gait mechanics.." Med Sci Sports Exerc. 2001 Jan;33(1):142-7. Bohne M, Abendroth-Smith J. "Effects of hiking downhill using trekking poles while carrying external loads.." Med Sci Sports Exerc. 2007 Jan;39(1):177-83. Porcari JP, Hendrickson TL, Walter PR, Terry L, Walsko G. "The physiological responses to walking with and without Power Poles on treadmill exercise.." Res Q Exerc Sport. 1997 Jun;68(2):161-6.